Around here it really seems we eat the most pie in November and December, with a slight uptick in the summer when I make a decide to make a Berry or Key Lime pie. Pie is by far Zack's favorite dessert. He asked me to make him a pie for his birthday, any kind of pie. Unfortunately I was not the best wife when it came to his birthday and instead he got brownies...from a box. Zack, being the type of guy to just let things go, reminded me weekly that he never got his pie. I decided I needed an end to his yammering so I made this apple pie and I enjoyed it just as much as him. The filling is from a recipe I found online and it truly fantastic. It was a little runny, but the flavor was incredible. I highly recommend you add this to your upcoming holiday menus. Preheat oven to 425 degrees Fahrenheit. Mel the butter in a saucepan. Stir in the flour to form a paste. Add water, white sugar, brown sugar, and cinnamon and bring to a boil. Reduce temperature and let simmer. Please the bottom crust in your pan. Fill with apples, mounded slightly. Slowly pour butter sugar mixture over the apples. 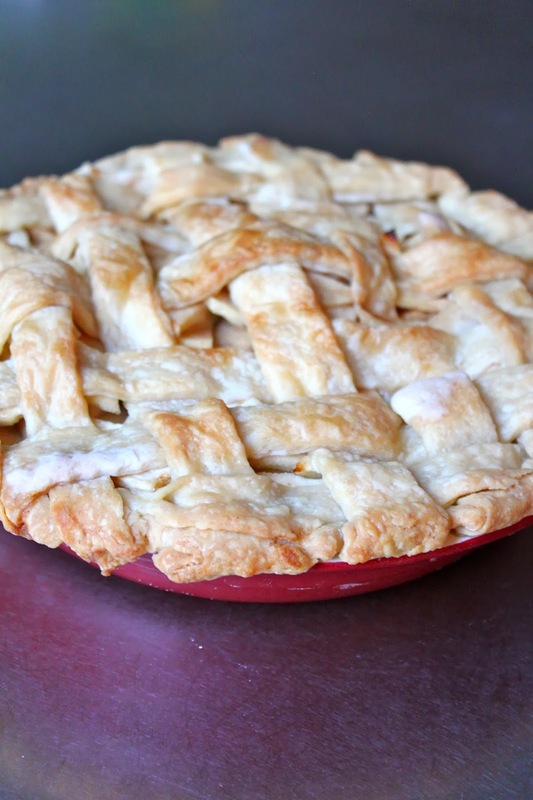 Cover with lattice work crust. Bake 15 minutes in preheated oven. Reduce temperature to 350 degrees Fahrenheit. COntinue baking 35-45 minutes, until apples are soft.